This song by The White Stripes has become a tradition to sing at our first middle school gathering. I got a little choked up singing with everyone on Wednesday, counting my blessings to be part of this community. Although I’ve really been back at work for the last few weeks, it didn’t truly begin until this. Honestly, it feels more like a family reunion than going to work. Our head of school began last Tuesday with an address to the entire faculty and staff. She referred back to her charge last June to be open to change and wove it into a story about Taliesin House, built by Frank Lloyd Wright. As she describes it, Taliesin is beautiful from a distance, with horizontal and vertical lines that nestle it into the hillside, yet as you get closer, you see that every space in the house is under constant redesign. This makes the building itself feel alive with change as the designers perpetually seek improvement. The metaphor was perfect, even if obvious, in capturing the essence of the constant growth that should take place in a school. While striving for vertical and horizontal coordination, we should all be fundamentally engaged in improving in our individual practice. Furthermore, this metaphor gives us the twofold direction she has chartered for this year: (1) coherent school identity, facilities, and program and (2) curriculum changes to align with PreK-12 curriculum and the Essential Competencies and support system upgrades. The first day of school is, perhaps obviously, unique to education, and it brings with it a unique opportunity. We get to start over. A new year. We can redefine who we are, how we are, and what we do. It doesn’t mean it’s easy, but it’s possible, and the resounding optimism in the air is contagious and powerful. 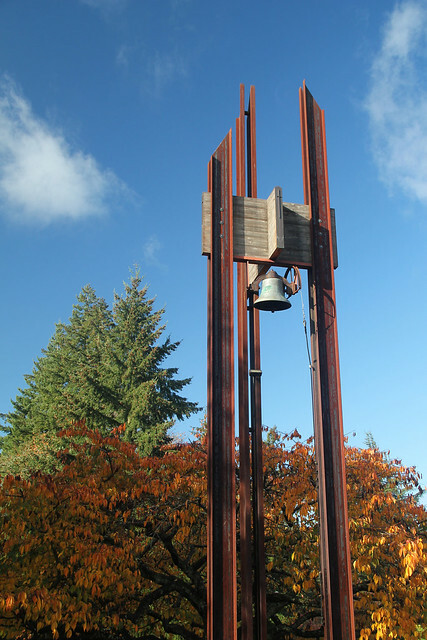 The bell tower ceremony is the annual opening of the school year, during which everyone on campus gathers together. Facutly, staff, and parents mingled with students sitting with their grades around “the circle” at the heart of campus. This includes the youngest Pre-Kers and the oldest seniors, who entered last to rowdy cheers. Preparations are in place, people are gathered, and the bell is rung to bring everyone together. The head of the board, the head of school, and the student body president each make remarks. This year, while it got a little long, the sentiments were powerful. We heard many times about being “open” (our new branding/identity word): open to change, open to the opportunity of a new school year, open to diversity of opinions and cultures. Our head of school also introduced the idea of synchronicity, illustrating it with a story of rowers sending each stroke in unison, propelling the boat smoothly and effectively through the water. For a school poised to change, this was the signal for action. Traditions like the bell tower ceremony mark the passing of time and give us space to take stock of where we are and who we are. Traditions keep us grounded in times of change and help us cope with life’s transitions, like the return to work after summer play. More and more, I understand that change is emotional, even if you are excited for it. (This is a continuing effect of the Klingenstein Summer Institute that so profoundly broadened my perspective on institutions, people, and education.) Being still in that moment at the bell tower allowed me to notice, to look back and look forward, to take the long view in both directions, to honor the past that had brought us to this moment and embrace the possibilities in the efforts that lay before us. During a gathering of the middle school faculty last week, we were asked to share what we were most excited about for the year. For me, it is being surrounded by children who show me so many different ways of being in the world. They inspire me to be a friend first, to take risks, to get ridiculously excited about silly things, to be present. Singing together, watching their hopeful faces, the optimism bursting, reaffirmed the soul-satisfying, whole-hearted work that I do.